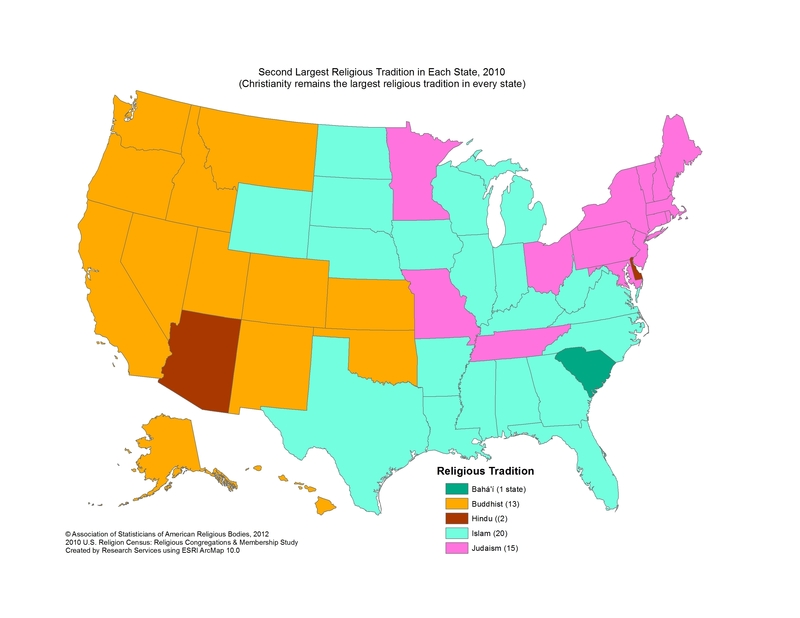 This recent map making the social media rounds depicts the runner-up religions for each U.S. state, based on data from the US Religious Census project. NPR, among others, has discussed the map, attempting to explain the anomalies in the map. Why is South Carolina’s second largest religion listed as Bahai and Tennessee’s Judaism when every other southeastern state is Islam? 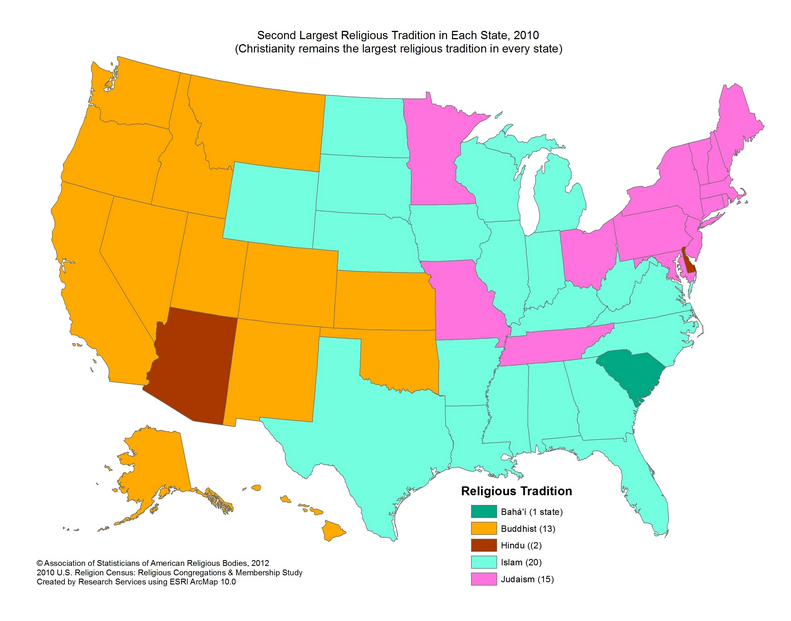 Why are Delaware and Arizona the only states with Hinduism as the second largest religion? The apparent necessity of discussing such surprises clearly illustrates the point that the analysis of the data (the creation of the map) constructs the stark anomalies rather than simply describing anomalies that exist in society. The analysts take the data, in this case reported by some institutions, including national bodies and local churches, mosques, etc., and estimate the total for each religious group on the county level. Tabulating the totals for each state then enables them to select the runner-up religion and construct the map. The map, however, loses all of the nuance of the statistical data, implying stark differences that call for the generation of explanations. To see how some anomalies have more to do with the process of constructing the image than a simple description of the data, consider the data for Delaware. 7805 adherents were reported in relation to four categories of Hindu institutions, for 8.7 percent (combining the given percentages in the table) of the population. The “Muslim estimate” (see the procedural explanation) for the state is 7124 adherents for 7.9 percent of the population. So, Hindus win second place by less than 1 percent. Of further note, one traditional Hindu temple reported 6000 of those Hindu adherents, making me slightly suspicious of the care with which the person estimated the number of adherents there. The data on Tennessee, which has Judaism as its runner-up religion, is even more intriguing. The three subgroups labeled Judaism in the data total 15590 adherents for 2.4 percent of the population. (Of note, two Messianic Jewish congregations are listed, though they give no adherent numbers. Would they count as Jewish for the tabulation, of course, depends on whose definition of Jewish decides.) The Muslim estimate for Tennessee is 15384, for 2.4 percent of the population. Thus, based on the reported number of adherents, less than one tenth of a percent separates the runner-up from the third place group. Considering the role of estimates, self-reported institutional numbers, and missing data, such a difference would not be significant, but the map makes it appear crystal clear, giving no indication of ties, statistical limitations, or unresponsive institutions. And thus the map, not the society it describes, is what generates those comparative questions. Next PostNext Buying Nationalism, eh?